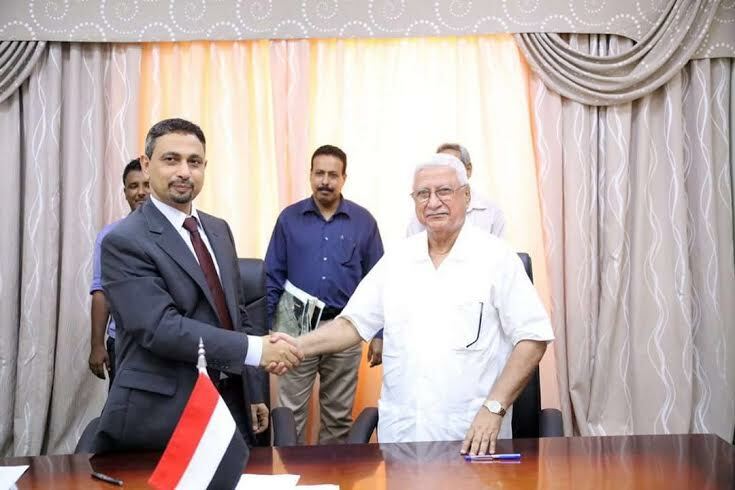 The agreement of Phase one of the project "Back to the House" was signed in Aden City between the Social Fund for Development and the Ministry of Public Works, with attendance of the Vice President and the SFD Chairman of the Board of Directors Mr. Khalid Bahah. The project aims to reconstruct 6,000 residential buildings which were partially damaged during the clashes and air strikes occurred during the conflict that took place in the city during the first half of 2015. The initial value of the project worth two billion Yemeni riyals (more than US $ 9.3 million). The project is one of the reconstruction projects through which the SFD aims to rehabilitate the areas where the conflict ended with a widespread impact on infrastructure. The "Back to the House project aims to encourage the city residents who had fled out of it to return to their houses, and start their livelihood and their normal lives. The project agreement was signed by Minister of Public Works Eng. Wahi Aman and the SFD Branch Office Director Eng. Ghazi Ahmed. For his part, Mr. Aman called on the Yemen donor countries and organizations to contribute in providing with financial and technical assistance to support this key project and work on the implementation of the next phases. He also called on the to also support the rest of the war-affected governorates.